Perry Buffington, Ph.D., M.S., has over 20 years of experience in the medical consulting field and is currently a full-time senior lecturer at the University of Georgia, teaching psychopharmacology at the undergraduate and graduate levels. 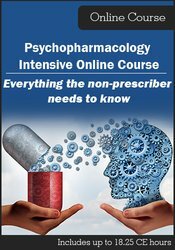 He is former chairman of the prestigious Florida Psychological Association’s Prescriptive Authority Committee and teaches seminars nationwide on minimizing psychopharmacological errors. As the author of eight books (currently working on his first psychopharmacology text), his by-line has appeared in hundreds of periodicals including the Saturday Evening Post, USA Today, and Success. He is the former contributing editor for Delta Air Lines’ in-flight magazine, Sky, and served as a syndicated newspaper/web columnist for Universal Press. Additional, he hosted his own radio show, syndicated nationally, by Envison Radio Networks. Perry’s presentation style is engaging, a blend of education and entertainment; as a result, critics (and especially his students) applaud his ability to make complicated topics understandable and applicable – even useful!! Financial: Perry Buffington is the President of Go-Buff Enterprises, Inc. He is a member of the psychology faculty, Franklin College of Arts & Sciences, The University of Georgia. Dr. Buffington receives a speaking honorarium from PESI, Inc.
Nonfinancial: Perry Buffington has no relevant nonfinancial relationship to disclose.